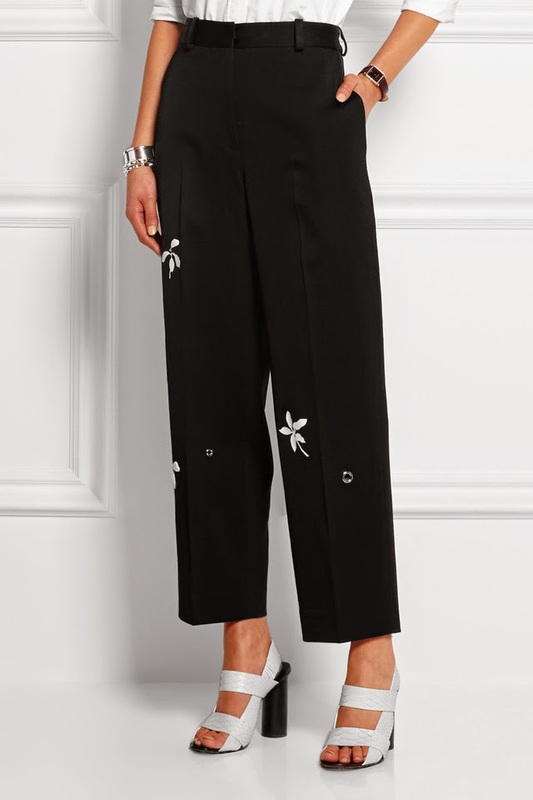 Oh hello, daisy appliquéd trousers. I’ve been expecting you. If you could walk your size 10 waist over to my wardrobe I’d be happy to match make, pairing you with a crisp striped shirt and grey wedges. I think we’d get along very nicely together. In fact, I’d go as far as saying this may be your destiny. You see, Jonathan and I (yes, me and Mr Saunders are on first name terms) believe that we were meant to be together. As one. You wouldn’t want to upset Jonathan now would you? You look like you’ve been made in what I can only imagine is the softest wool blend. Imagine how comfortable you’d be when worn. So you see daisy appliquéd wool-gabardine wide-leg trousers, you belong to me. Hanging prettily in my wardrobe. Be mine. very cute trousers, would fit perfectly into anyones wardrobe!